Dr. Moelleken recognizes that there are many procedures available nowadays to restore and rejuvenate your appearance. Facelifts (rhytidectomy), Eyelifts (blepharoplasty), Chin Implants (mentoplasty), and Nose-reshaping (rhinoplasty) surgery are just some of the procedures available that alter your appearance. Nothing can be worse than undergoing plastic surgery only to have the outcome not turn out the way you expected. This is especially true with procedures such as rhinoplasty because its impact affects your facial appearance. There are many reasons why you may not be happy with the results of your rhinoplasty, especially if your surgeon lacked the proper skill or experience. Sometimes however, even an experienced surgeon can encounter unexpected problems but whatever the cause; an unsuccessful nose surgery can severely impact your self-image. Fortunately, the good news is that most bad nose job surgeries can be corrected with revision rhinoplasty, a second nose surgery to correct unfavorable flaws. If you are unsatisfied with the results of your rhinoplasty, contact Neo Surgery Center today and let us set up a consultation with Dr. Moelleken to discuss the best correction procedures available for your situation. Dr. Moelleken knows each patient is different and that each revision rhinoplasty is unique. Speaking in general terms however, revision surgery corrects rhinoplasty problems through reconstruction and reshaping. Dr. Moelleken is one of the most sought-after restorative plastic surgeons in the world. He is highly skilled at taking the most complex revision problems and giving his patients the results they desire. Some revisions involve major techniques. So adept is Dr. Moelleken at rebuilding noses that are aesthetically pleasing and functional, he is noted as one of the leading reconstructive surgeons in this area of plastic surgery. Beyond his noteworthy skills however, Dr. Moelleken is respected and praised by his fellow surgeons and patients alike for his compassionate approach to patient care. Every person has their own vision of beauty and one of Dr. Moelleken’s main objectives is to develop a treatment plan designed to help each individual achieve their aesthetic goals safely and effectively. Dr. Moelleken brings a compassionate approach to this delicate area of plastic surgery: that of performing additional work on an area of the patient that has previously been operated on by another surgeon. He offers strength and empathetic consideration to re-instill confidence in a patient that may be wary of undergoing a rhinoplasty operation again. Whether your nose is too short, too long, too wide, too narrow, twisted, or unappealing in some other way, if you are considering nose surgery the most important thing to be aware of is Dr. Moelleken’s credentials to ensure that you could not be in better hands. If you are unhappy with the results of your first nose surgery, Dr. Moelleken can help you achieve the results you have been looking for so call today. 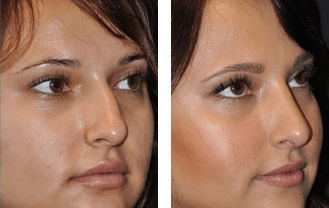 A Rhinoplasty Revision surgery is a revision if your nose has been operated on before. Patients who seek a second surgery to revise their rhinoplasty often do so because they are dissatisfied with the symmetry of their nasal tip and because they experience nasal obstructions, according to a report in the Archives of Facial Plastic Surgery, one of the JAMA/Archives journals. Approximately 20 percent of patients who have rhinoplasty [plastic surgery on the nose] seek revision surgery either because of necessity or a personal preference, according to background information in the article. That statistic does not take into account the many patients who are unsatisfied but are reluctant to undergo the procedure a second time. “To optimize patient satisfaction from revision rhinoplasty, the surgeon must be keenly aware of the functional and cosmetic deficiencies that the patient considers most problematic,” the authors write. With the number of people turning to plastic surgery, and in particular rhinoplasty, to improve their looks and their self-esteem rising each year, the number of people who are ultimately unsatisfied with their procedure is no doubt rising as well. One of the most complicated problems encountered after rhinoplasty surgery is the cosmetically unappealing loss of balance with the remainder of the face. Imbalance among the components of the nose can make it appear “fake” and maintaining nasal balance during rhinoplasty is the true art of plastic surgery. Correction of nasal balance involves adding and removing structures to the nose in carefully planned patterns. Added structures might include cartilage from the inside of the nose, ear, or rib and if necessary, bone can be added from the hip, ribs, or skull. Neo Surgery Center has state-of-the-art software programs allowing you to see the corrections that can be made after your revision nose surgery. It is important to keep in mind however that a computer program is limited and does not exactly mirror the unpredictable nature and limitations a surgeon faces when working with tissue scarred from prior surgery. 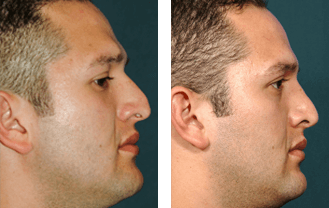 Modern rhinoplasty is centered on the principle of reshaping the nasal support to achieve desired aesthetic appearance. The results are not only more natural, they are much more stable over time and in addition, these techniques allow for improved nasal breathing function. When performing revision rhinoplasty, Doctor Brent Moelleken M.D., F.A.C.S., feels it is important to address not only the aesthetic issues in the way your nose looks but also all of the functional issues involving your nose as well. Dr. Moelleken is a Plastic and Reconstructive surgeon serving in Beverly Hills and Santa Barbara, California. Double board certified, he received his training at Harvard University, Yale University, UCSF and UCLA. Dr. Moelleken is one of three specialty-trained surgeons in the world to complete the yearlong Aesthetic Surgery Fellowship at UCLA. He maintains the prestigious FACS degree and is a member of the ASPS and ASAPS. He has published numerous peer-reviewed articles on plastic surgery and has presented his techniques at national and international conferences.